Big Island Ohana Cafe. Owned by a father and mother, run by daughter and son. I never knew their names or their nationality. They had vintage signs on the wall and still offered banana splits and malt milk shakes. They were cash only. When I moved here I ate there a couple three times a week, usually getting bacon cheeseburgers, fries and a drink for me and my boss. The store changed owners and my shift moved to the evening when BIOC was closed so I stopped eating there. We started going to church and would eat lunch at 'Ohana Cafe every Sunday. Over the summer my hana'i nephew paddled every Saturday morning and we took him there for lunch afterwards. We went often enough that they let me order off menu. 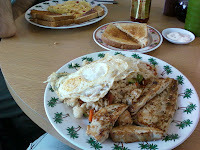 I usually got fish over fried rice with eggs over medium. It was fantastic. Jessie got the same thing every time, which with their accent, was pronounced "Frenche Toast." They closed 2 weeks ago. BigIslandVideoNews.com has video of the corner being torn down. It may have been ugly but I don't see 15 new parking spaces being better than the 'Ohana Cafe.